He is the holder of one the of oldest athletics' records. 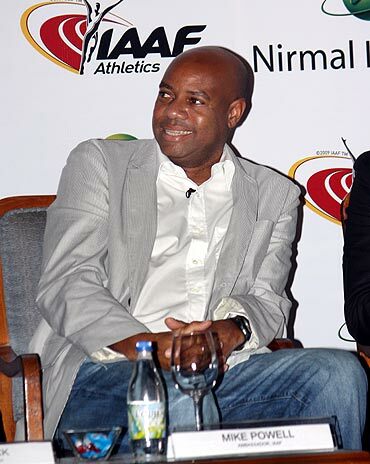 Mike Powell jumped 8.95 metres in the IAAF World Championships in Tokyo (Japan) back in 1991. 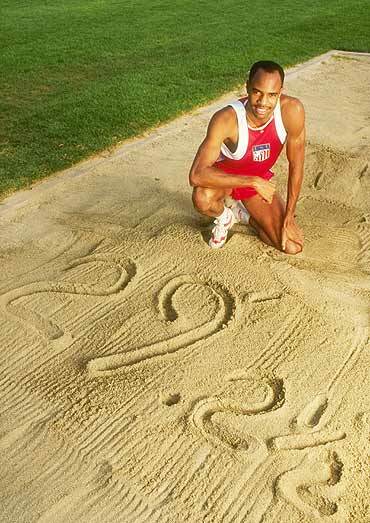 That remains the world record in long jump even after two decades. And the American still can't have enough of it. 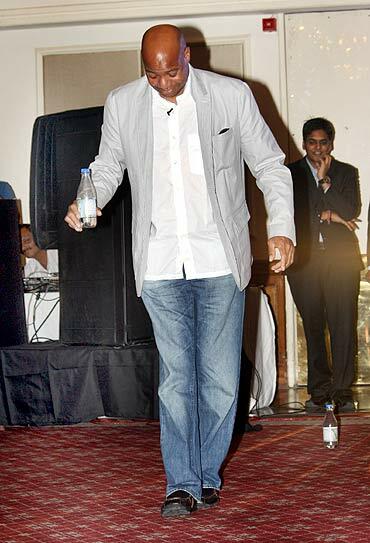 In India, to promote athletics, Powell's hosts played the clip featuring that landmark jump twice over. And along with his many fans, Powell quietly watched the clip with the same enthusiasm. "I never get tired of watching that," confessed Powell, before proceeding to elaborate on that landmark moment. "The biggest reason why I broke the world record is because I believed I could," he gushed, before negating that he was surprised with his eventual effort considering his compatriot and rival Carl Lewis made the best six-jump series in history ahead of the final. "No, I wasn't surprised at all," explained Powell, adding, "I went into the final knowing that in order to win the competition, I'd probably have to break the world record." 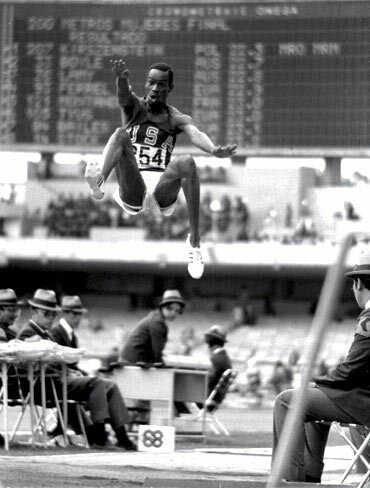 The American's effort in the Japanese capital on that fateful day in 1991 ensured his compatriot Bob Beamon's longstanding record a jump of 8.90 metres at the Mexico Olympics in 1968 was finally broken. And now his record has not been broken in 20 years. In fact, in the last five decades only four athletes have managed to hold the long jump world record. Asked what is it that makes the long jump record so difficult to break, Powell came up with a pragmatic answer. "When Bob (Beamon) broke the record, the mark was so high that it took years for athletes to even start thinking about breaking the record," he explained. "When I look at the athletes now and see what they are doing, I don't see them breaking the record," continued Powell, adding, "I mean they are talented but what they are doing doesn't equal what they should be doing. "When I was competing, I was learning. I was getting beaten a lot, by Carl (Lewis) and others jumpers. And I was learning a lot from each of those defeats. "But nowadays they don't have any body to learn from." On the field Powell successfully managed to defend his world title two years later in Stuttgart (Germany), while also managing to secure the bronze in Gothenburg (Sweden) in 1995. However, if his career was highlighted by those two world titles, there was a huge regret as well. The American could never win an Olympic gold medal, considered by many to be the benchmark for any athlete. 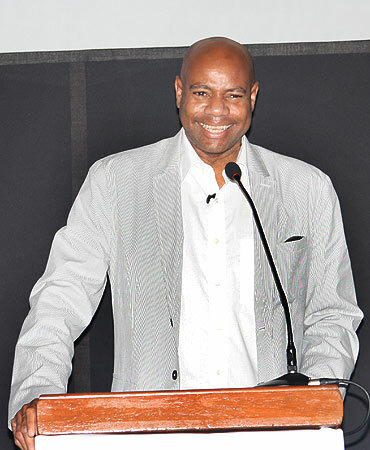 Having had the opportunity to compete in the Olympics on three occasions, Powell could only end up with two silver medals in Seoul (1988) and Barcelona (1992) for his efforts. No doubt it remains a huge regret. The American had no qualms about admitting the same. "Oh yeah! Every time I think about the Olympics and not winning the gold medal it makes me very sad," admitted Powell, adding, "I should have won in 1992. "But it was a strategic mistake on my part I warmed up too hard and my body broke down completely afterwards and Carl (Lewis), being the great athlete that he was, knew how to handle the situation. "He had competed in three Olympics already and it was my first. The first time I was a star, the first time people were asking me to sign autographs and the first time things were so different." The American then made an effort to camouflage the regret with a tinge of optimism. "I knew that I did my best and that's all I can say," said Powell, adding, "Had I not tried my best then I would have had some regrets. "But I tried my best and lost to one of the greatest athletes of all time (Lewis) by three cms 8.67 metres to 8. 64 metres. "You win gold sometimes with that distance. But then you can't have all." In the course of his explanation a palpably emotional Powell had turned a tad philosophical. "But that's part of life," he continued, adding, "That's the good thing of being an athlete, a sportsman. It's the microcosm of life. "You have to learn to live with the good and the bad. I got the world record but didn't get the Olympic gold. "But now when I look at it, I see that I competed at the Olympics three times and do have two silver medals. "It is one thing to have success but it's harder to stay up there." 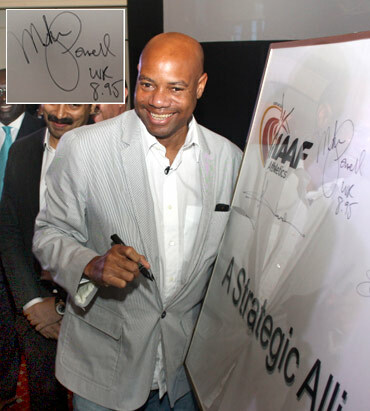 Powell proceeded on to compliment his compatriot (Carl Lewis). "I was good. But Carl was the best," admitted the 47-year-old, adding, "I was fortunate that I had the opportunity of competing with him. "I was also unfortunate to have competed against him." His rivalry with Lewis may have prevented Powell from winning a few more golds. It nevertheless made the sport exciting, something that is amiss from long jump these days. Asked if long jump has suffered as a sport in recent years, Powell was circumspect in response. "I don't know if long jump is stagnating," he said, admitting, "It is sad for me to see the state in which the sport is right now. "It is sport where some of the best athletes ever have competed. "I think everything goes in cycles. Maybe the sport is down now. But hopefully things will come up." Before we could end the conversation it was imperative to ask the legend regarding his views on doping, a scourge in world athletics for many years now. "On most occasions athletes end up using performance enhancing drugs is because their coaches tell them to do so to be able to compete," explained Powell, adding, "As for myself, my coaches told me I didn't need to that. "I could achieve the results just by working hard." The American then explained the moral aspect. "It's doping and competing - cheating. And to me that matters," explained Powell. "When I talk to my daughters I know I did the right thing," he continued, adding, "Now it's like 'your dad was pretty good.' And I am not lying. "So for me to cheat to win isn't the right thing." The American expressed his satisfaction regarding the steps taken by the governing body to control doping. "Atheletics is one of the few sports which is willing to burst its stars," said Powell, adding, "So it shows we are taking the matter seriously. "If an athlete is trying to use some dope these days, then he is taking a big risk. And that shows athletics is at the fore front in taking control in matters of dope." Oscars 2011: Winners at a Glance!